I was thinking about adding an Arachnid Galaxy 3 Dart Board gaming system. Any thoughts or other recommendations? Get a steel tip board. Way cheaper, way more fun. There are apps for scoring if you don't want to do it manually. That's what I went with. I even tried an electronic board that can accept steel tipped darts, but still too many bounce outs. Steel tipped is way quieter too. That looks nice. What sort of wood did you use for the backing? Yeah I love our dart machine. I don't wanna keep score and the machine knows many more dart games and variations than I do. Plus it's easy to keep track of whose turn it is to throw. The machine is not very deep, so it hugs the wall and doesn't take up any more space than a regular dart board since that also requires a surrounding area. A dart machine also has its own lighting, so no need to place a dart board under an overhead light or create lighting for it. Plus it is just way cooler than a dartboard. Man...the galaxy 3s are awesome ! You can download apps that will keep score for you, or get external scoring mechs. I use the apps sometimes, but most of the time we're just playing games like around the clock when socializing, or our own variation. I dont need to have a machine keep track of how many darts Ive thrown, so I've never quite understood that. Scoring common games (cricket, 501, etc) is really easy on a whiteboard, too. Steel tip >>>> soft tip. The nicest bristle board you could ever want will run at most $100. It is quiter, as Floyd mentioned. There are a plethora of lighting options, none of which are going to cost much at all. Very few bounce outs. 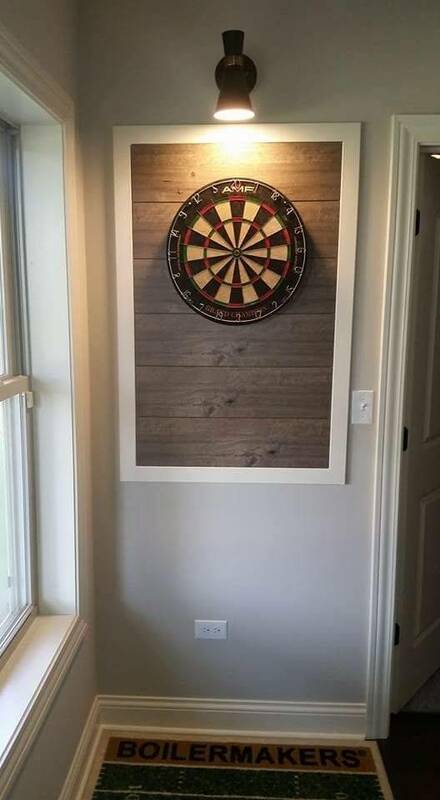 I think every game room needs a dart board, but this is just one of those cases where you can save money AND get a much better experience. Edit; here's the board I was thinking of, and it's only $65!!! Arachnid goes make wall mount boards that offer a lot of features. Much less expensive as well. Well worth checking them out! My Arachnid Top Gun Challenge cost me $200. I've also had several Arachnid English Mark Darts machines that were under $200. Yeah, the newest machines are really cool looking, but are very expensive for just playing darts. If you're comparing the new machines that cost over $1000, then I'd choose a regular dartboard setup. Go with an older machine that works great, they're very inexpensive and easy to find. You still have the "wow" factor of having a coin-op dart machine in the game room, but at a fraction of the price, for the same dart experience. Or you could get a better experience for $65. I wouldn't play a dartboard if I had one. I simply don't wanna do math when shooting darts & drinking at my bar. It's some kind of composite ship lap stuff they sell at Home Depot or Menards (don't remember which, probably HD). I think it's tongue and groove. If you look at the bottom, you can see there is a repeating pattern in the fake wood grain which kind of bothers me. I should've tried to stagger it more. You can also paint a 2x4 acoustic ceiling tile. Turn it around so the tiny holes face the wall. It works great as a backboard. They just released the new G3 with auto moving head. They had been working on the motorized head for 3 plus years.